Too many politically correct praise-heapers are giving Marvel’s blah “Black Panther” the same patronizing diversity pass they bestowed upon last year’s DC Comics dud “Wonder Woman,” as if movies like these automatically are elevated from generic mediocrity based on how many minorities or women were involved in making them. While “Black Panther” is a serviceably average superhero flick, it definitely is not a great one, regardless of any historic importance it achieves for featuring a nearly all-black cast as well as a black director (Ryan Coogler) and black writers (Coogler and Joe Robert Cole). Although the character was created in the 1960s by white guys Stan Lee and Jack Kirby, both were Jewish, which may count for something to the sort of people who care about things like that. 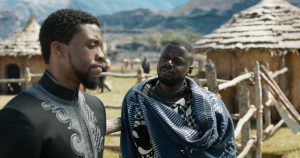 The story here is simple enough: Newly installed King T’Challa (Chadwick Boseman) of the reclusive and highly advanced fictional African nation Wakanda is faced with challenges to his rule. He also wants to apprehend a murderous arms dealer who has stolen some dangerous Wakandan precious metal that can be used for nefarious purposes. The movie’s main problem is that the soft-spoken king, who moonlights as the costumed title hero, is unintimidating, uninspiring and uninteresting. He’s more of a blandly even-keel Obama than a fiery Malcolm X, which means he also is considerably more mild mannered than the radical political party that adopted the Black Panthers name the same year as the character’s 1966 comic-book debut. The silly accent Boseman employs as T’Challa—which falls somewhere between Archbishop Tutu and Apu from “The Simpsons”—doesn’t help. 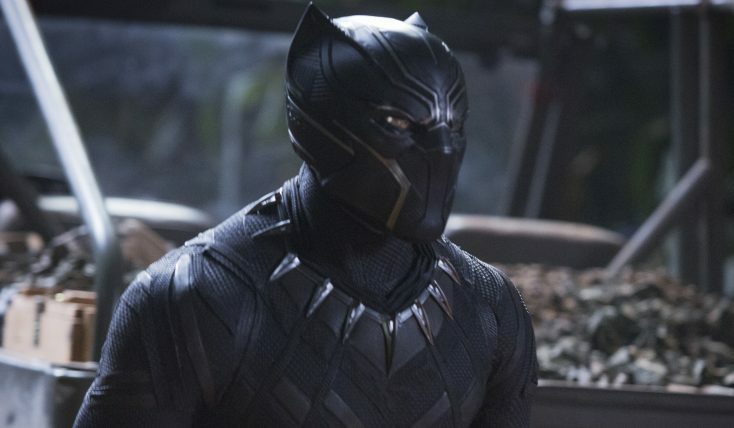 Even worse, T’Challa shows a lack of both passion and compassion that makes him come off like a right-wing Republican’s dream: a restrained black man who accepts the global status quo despite knowing that oppression and injustice make life outside his isolated enclave considerably less utopian for other members of his race. Boseman is outshined by nearly every other member of the cast, especially Michael B. Jordan as the street-lethal and frighteningly militant pretender to the throne Erik “Killmonger” Stevens. With fashionably off-center dreads, hundreds of raised body-bumps indicating each of his kills and a viciously badass attitude, Killmonger wants to supply Wakanda’s advanced weapons to his agents in major cities, so “the two billion people that look like us” can rise up and take power. If Quentin Tarantino had been in charge, it would have been interesting to see Killmonger and company go full Django on various presidents, prime ministers and premiers to create a black planet to be feared. Instead, the safely cornball climax we get is so unsatisfyingly sappy that it not only castrates the Killmonger character but undercuts his revolutionary message. 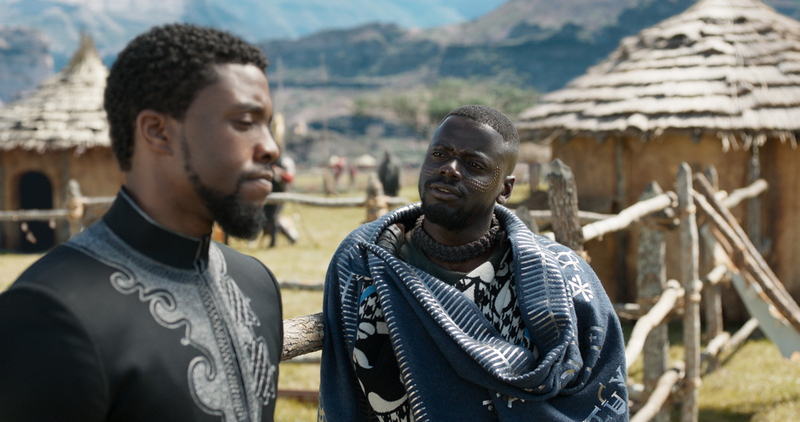 While T’Challa (mild spoiler alert) does finally decide that Wakanda should come out of hiding and share its futuristic tech with other countries, this essentially means providing it to the same business-as-usual leaders still holding the reins of power that Killmonger wanted to seize. Way to elevate the race, your highness! Politics aside, the script also has logic and suspension-of-disbelief problems. An especially groanworthy one is the idea of anyone accepting the premise that a certain extremely important character is dead without expending any effort whatsoever to confirm this by locating his body. Plus there’s the old “allow the bad guy you have wanted to capture for years escape, instead of letting others deal with a wounded comrade while you continue the pursuit” device. And the concept that an otherwise civilized society technologically advanced enough to leave CIA Agent Everett Ross (Martin Freeman) in wonderstruck awe would select its head of state based on a brutally barbaric trial-by-combat ritual seems almost racist in its implication that even the most modern Africans would cling to such a savage tradition. Europe and the US did away with duels shortly after the invention of the combustion engine, but it still is possible to become monarch of 21st-century Wakanda by throwing a dude over a waterfall? Ouch. Danai Gurira shows that she can wield a souped-up spear as fiercely as she swings Michonne’s sword on TV’s “The Walking Dead.” Lupita Nyong’o is T’Challa’s not-so-ex Nakia and an undercover Wakandan spy, although it is not clear what the hidden kingdom would do with intel gathered from outside its bubble-barriered borders. Letitia Wright is T’Challa’s teenage sister Shuri, an apparently genius-level inventor who supplies him with Q-type James Bondian gadgets but who seems to have dropped in from an annoying sitcom. Andy Serkis is murderous one-armed arms dealer Ulysses Klaue, whose missing limb has been replaced with a powerful blaster. The CGI that animates the Black Panther when he is in action doesn’t seem quite state-of-the-art; the character often seems as “mass-less” as Spider-man did during the Sam Raimi trilogy. Futuristic aircraft look videogame-like, and a pack of CGI armored rhinos are just plain ridiculous. On the positive side, although Killmonger’s hood dialect includes lines such as “I ain’t worried about no brand,” his “I’ma burn it all” that appears in the movie’s trailer does not feature that unfortunate first contraction in the finished film. Score one for the grammar good guys.